I’m sorry, I can’t help but ask! Has anyone made a Jamie’s 15 Minute Meal recipe in 15 minutes? I probably ask the same question every time I make one but still, I need to find someone that can and ask what the secret is. I didn’t even serve the additional salad that he serves. Mr S says this is the best meal he’s had recently but as good as it was, I disagree. It was salty and it was chicken so I’m not surprised. Get sweet chilli sauce, polenta, cajun seasoning*,smoked streaky bacon, oil & seasoning ready. Pop the potatoes in boiling water and cook through. Mix the polenta with the cajun seasoning and coat the chicken. Cook the bacon slices then remove and cut into pieces. Pop a little oil in a pan and heat. Cook the chicken for about 4 minutes each side or until cooked through. Mash the sweet potatoes and add a little seasoning and some sweet chilli sauce. Slice the chicken and serve on a bed of the mash, scatter over the bacon pieces and garnish with the parsley. * I made my own using smoked paprika, ground coriander, ground cumin, dried thyme, dried oregano, garlic salt and a little salt & pepper. love it! Looks good to me! Quick and chicken are to of my favorite words. 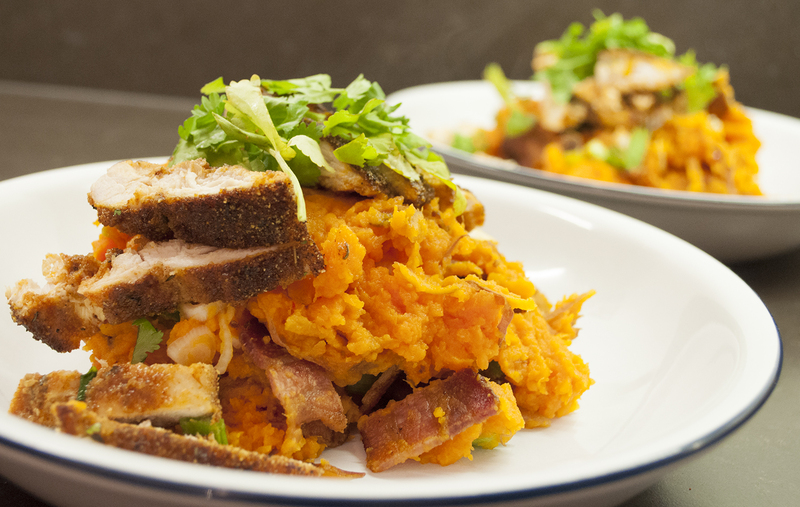 ….also I really like the healthfulness of the sweet potato addition. That makes it almost seemed like a slow cooked meal. Sweet potato is definitely the accompaniment of the moment. which is by no means a bad thing. So tasty. It does look like a meal that needed a lot of effort.